Caley Thistle’s ‘class of 2018’ will prove vital in driving the club forward, according to fans’ favourite David Raven. Daniel MacKay is the headline name of the group, having made a huge impact in his debut season, but the talented group of fresh-faced players can provide the backbone of future Inverness success. Jack Brown and Cameron Harper also tasted first-team action under John Robertson, while Gabriel Hastings, Roddy Kennedy, Kieran Chalmers, Roddy MacGregor, Ryan Fyffe, Harry Nicolson and Ross Gunn complete the set. MacKay is the club’s youngest scorer and a Scotland schoolboys internationalist, where he played alongside Chalmers. They are all part of the under-17 side which was so successful in the Club Academy Scotland League System this season and all signed senior deals last month. 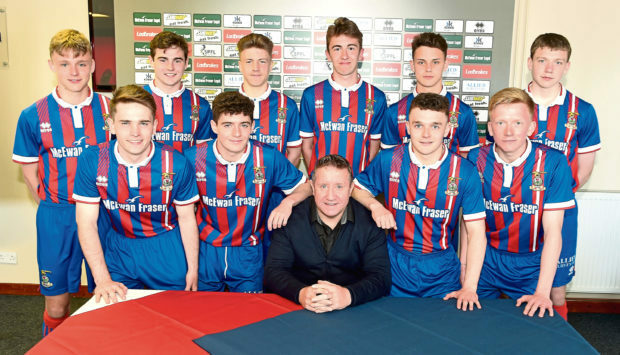 Raven, who coached some of the group at Caley Thistle, said: “They’ve got massive futures. The club needs some youth team guys that can kick on and I think they will do it. Long-serving players like Gary Warren and Carl Tremarco have also assisted with some of the club’s younger teams and Raven feels the Caley Jags need to do all they can to keep them around at the end of their careers in a coaching capacity, despite Warren being told he is free to find another club. He added: “They’re the kind of guys you don’t realise how lucky you are to have them until they’ve gone. “They’ve got to have something about them to stay in the game for so long. “It gives guys coming through someone to look up to. “They are benefiting because they’re gaining experience but the club is benefiting massively from it. It’s a no-brainer for me. Raven left the club in January this year, moving to Wrexham in the National League. He was let go at the end of last season and is on the lookout for coaching opportunities in the game.